Lynn from Lynn’s Kitchen Adventures is sharing my recipe for Quick and Easy Peanut Butter Granola today. It was originally in one of my ebooks that I put together and sold way-back-when and I gave her permission to share it on her blog. This is such a simple and economical recipe and it freezes well, too. I’ve not made it for quite some time, though, and now that we’ve eliminated regular oil and processed sugar in our baking, I’m thinking about trying it with coconut oil and sucanat instead of the oil and brown sugar. Not sure if it will work, but I think I might give it a shot! « Time Management: What questions would you love to have answered? I’d be interested to hear if you like the recipe with the changes you mentioned. We’ve been making your whole wheat chocolate chip pancakes for breakfast lately and love it. I was wondering about using sucanat in place of the turbinado in that recipe too so I might try it next time we make it. Thanks for all you do & share! I use coconut oil all the time it stuff like this I don’t see why it should not work out just fine. I would probably melt the oil and add it to the sucanat before I added it to the oats- just to soften it a bit. I use sucanat with honey for white sugar and sucanat for brown sugar. I just pulled 6 loaves of pumpkin bread out that I made with coconut oil for the first time. They look great! Perfect! I just told my son this morning we’ll make some peanut butter granola after school. I think we’ll give this recipe a try and I even have loads of coconut oil on hand to try in the recipe. I use coconut oil and sucanat in everything I bake and it works just fine (as long as your kitchen isn’t too cold:-). So I am sure that it will be wonderful in this granola recipe. that can make granola bars or granola (and you can substitute cashews for peanuts) My family can’t get enough of it, its saving me money, and its full of healthy goodness! @Heather (Creative Family Moments), We are actually now PB free because my daughter was diagnosed earlier this yr with a peanut allergy. In the post I talk about now adapting it with soy nut butter. It works great. Awesome, I’ll check it out! Always can use more of that! Just curious if soy nut butter is fermented? I’ve read a lot about soy being very bad for your health, unless it’s fermented (ie – soy sauce). @Holly, I am not sure on the fermented part, I am guessing it is not. I would have to look into it. I have mixed feelings on soy and we eat limited amounts. Really only in the soy nut butter (a few times a week) and in soy sauce. My daughter developed a life threatening allergy to all tree nuts, peanuts, and sesame earlier this year. The options are very limited so for us, I feel soy in limited amounts is fine, but you would have to research it to decide what is best for your family. I hope that helps. Thank you so much, Lynn, that helps a lot. I appreciate your comment! I’ve been interested in trying coconut oil, but haven’t been able to find a lot of info on how to substitute it in. Does it sub for vegetable oil, canola oil, or both? Does is sub 1 for 1? Do you always need to melt it beforehand? I’d love to start using it! @Dana, Me too! I just have no clue how to use it. I just substitute it straight 1 for 1 and melt beforehand. @Crystal, I use coconut oil as a substitute for butter and oil in all my recipes. All you have to do is melt it first. Make sure that you are not adding it to something that is cold or it will cause you to have chunks in your recipe. What type of oats do you use or prefer? I’d suggest rolled versus quick just to give more texture. @Crystal, I prefer regular oats, but quick cooking would work. Could you replace the brown sugar with honey? In my regular granola recipe from More with Less I don’t use any sugar, just honey. I’m guessing you wouldn’t need as much honey as you would brown sugar. I have tried replacing the oil with apple sauce before, and while it seems to work great in other baked goods, like muffins, the granola doesn’t turn out quite the same–not crunchy enough. @Molly J., I would be interested in knowing this, too. In my absolute favorite granola recipe the only sweetener used is honey. @Molly J., I have never tried honey, but I think it might. It would be worth trying with a least part honey. The only time I have had granola is in granola bars. 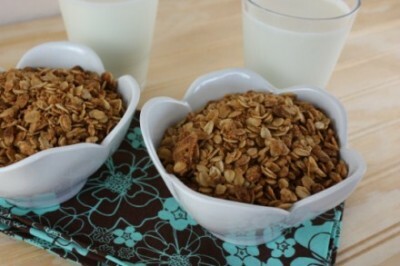 I would like to make this recipe…but I wouldn’t know what to do with all the granola when I was done with it! Any suggestions? Do you eat it plain with milk or use it in recipes? One of my favorite ways to eat it is in homemade parfaits — with layered yogurt, granola and fruit. @Katie, We love it just with milk or like Crystal said as granola parfaits, but we call them granola sundaes. This looks delicious! I’ll have to try it. Kudos to you for switching to coconut oil and eliminating processed sugar. I’ve done this as well and feel absolutely fantastic. That coconut oil is truly one of God’s medicines! I just have to share – I attempted to make this recipe this afternoon all the while my 2 year old kept trying to sneak away with the peanut butter and my 1 year old unloaded all our dish towels anywhere. Needless to say I was a bit distracted! Anyway, I got all done and I had a big gooey mess and I was thinking hmmm, this doesn’t taste very good, I can’t figure out why anyone would want to make this… then I realized I NEVER BAKED IT! LOL. 🙂 Tasted much better after baking!! I think I’ll try this with coconut oil, almond butter, and demerara. @Stacia, I think almond butter would work fine. I have a granola recipe…it calls for butter. I’d think you can use any type of oil you’d like, whether it’s butter or coconut oil. I use sucanat. I would melt it with the oil and peanut butter though since it’s my experience it takes just a bit longer to melt than brown sugar. My recipe also calls for some honey. We have switched out our oils to the “good” ones and changed our sugar to sucanat and honey. Things taste better now. And Wow, we have lot more energy and I no longer need to use my herbal supplement for low thyroid issues. Coincidence? I don’t think so. I assume you get coconut oil on the baking aisle at any grocery store? Is the price similar to canola oil? Or is this a tad more expensive? I buy it online — usually when Amazon runs a sale. @Kendra, I get mine (a huge jar, 54 oz.) for $20 on vitacost.com. It is extra virgin oil and organic, and it’s one of the biggest sellers on the entire site. You probably want to get a smaller jar to start off with to see how you like it. Right now, they are having a 10% off sale. I go through mypoints.com, and get I think either 4 or 6 points per dollar spent, which is really good. Check ebates.com, etc., if vitacost participates in their program. You CAN find it in the store (in the natural foods section), but it pretty expensive that way. Best wishes! This stuff is amazing in so many ways. I use coconut oil and real maple syrup. TO DIE FOR! I’ve been using the David Lebovitz granola recipe–applesauce replaces most of the oil. I think it has 2 TBS oil oil. It’s awesome and easy to sub other fruit purees/butters. Next on my list is pumpkin butter and pepitas! I have made this recipe countless times (from your ebook). It is a hit in our family & everyone is sad when it’s all gone! I just made it and its yummy. I used coconut oil, almond butter & organic maple syrup. I’m going to use this granola to make bars too. TY. @Yizzel, I am glad that you liked it and your changes sound great. I am so glad it worked for you. @Katie, Sorry just reread the post. Answered my question! I was wondering if there is any particular reason why you use Coconut Oil instead of other oils like Extra Virgin Olive Oil? How do you store your granola and how long will it last at room temperature? @Lake, I store it in an airtight container or jar. It does not normally last more than a few days in my house since I have three kids. 🙂 But I am guessing it would be fine for a week or so. I think Crystal’s idea of freezing it is good. I’ve been making this recipe from your old breakfast e-book and we love it! I’ve been using coconut oil and it gives a wonderful flavor. I just melt it along with the peanut butter. I’ve been making peanut butter granola substituting honey for the brown sugar and coconut oil or butter for the oil. We think it tastes better than ever! sounds yummy, and VERY simple 🙂 Gonna hafta try this one 🙂 THanks! This afternoon, I made this and it was so easy and so good! Thanks for sharing Crystal!. I’d be interested to see some of the other recipes from that ebook. Any chance of bringing it back?